This is my father's original Polaroid SX-70 Land Camera. I remember as a kid many family photos being captured by the dining room table or on vacation and I was lucky enough to have my Dad gift me his prized jewel a few years ago. It has sat in my camera cabinet on display since and aside from the occasional test photo with Impossible Project 600 film, it has gone mostly unused. A small technical observation, the 600 film requires the addition of an ND filter in the film cartridge in order to properly expose the film. I have not had great results and especially in lower light situations, the camera extends the exposure for far too long. This year, I am making a commitment to shoot with it more regularly and look forward to sharing some of the photos I am able to capture here on my journal in the new year. First thing I did was try to track down what year the camera was made. Each camera has a unique serial number. You can find it thanks to the Mint website. These cameras, and Polaroid in general is making a bit of a comeback and I for one am happy to see it. 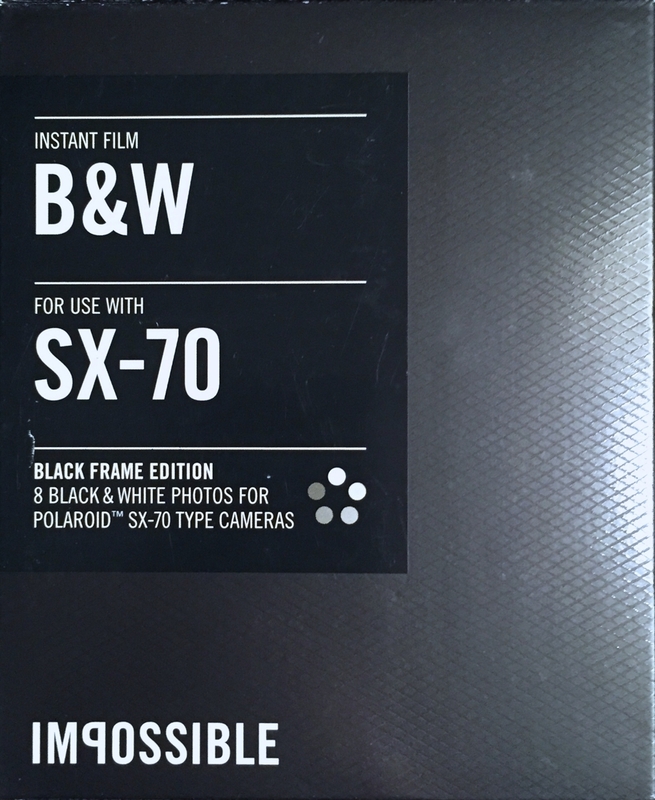 If you shoot with a Polaroid camera or have experience with Impossible Project please share your thoughts and observations below. If you are the proud owner of an SX-70 share a link to some of your photos! Note this journal entry will be a rolling review/entry with additions and scans/uploads. Each of the three images was tested in different light, natural direct sunlight, a set of Christmas lights, ambient light and overcast snowy outdoors. Just for fun, here is a classic ad for the SX-70. While more than an ad, it feels like a modern day review someone like Steve Huff might do or the guys over at DigitalRev, albeit with a much more serious, 1970's nostalgia and accompanying soundtrack. Thanks to Charles and Ray Eames on YouTube for posting it! A small side note, the music in this short video was composed by American Composer Elmer Bernstein. Mr. Bernstein was well known for his many film scores. Wikipedia suggests that "His most popular works include the scores to The Magnificent Seven, The Ten Commandments, The Great Escape, To Kill a Mockingbird, Ghostbusters, The Black Cauldron, Airplane!, and The Rookies." He won an Oscar for Thoroughly Modern Millie (1967) and was without question one of the most prolific contemporary American cinematic composers of his time. What I love most about this video is that it really does give you a sense of how advanced this camera was for its time. The SX-70 gave photographers an opportunity to bring a Polaroid camera with them in a compact and extremely beautifully designed package. The technology found inside was, in my opinion revolutionary. It's no wonder that Polaroid sold over 700,000 when it was first released and at $180 dollars in 1978 that would be the equivalent of just a little over $900 dollars today. A few weeks ago I had the opportunity to visit my parents back in Schenectady, New York and in the attic searched through volumes of photo albums to look for some original photos my father had taken with this camera. I was amazed at how many he had taken and for how long. Some of the photos go back to shortly after I was born in 1973 which coincides with the release of the camera with others dating well into 1985. I found a few that I thought I would share here as a way of acknowledging the love of photography my father unknowingly instilled in me as well as a thank you for his gift of sharing the camera with me so that I could create memories of my own. I was a little surprised to see that we had both taken photos of snowstorms. Enjoy! A few things to know about my Dad. He came to the United States in his early 20's from Pozzallo, Italy a small town on the southern tip of Sicily. By that time he had been fortunate enough to travel the world as a merchant marine for Gulf Oil. By the time he and my mother had me he had moved to the United States and settled in upstate New York. He was trained as an auto mechanic apprentice in Italy and eventually found his way into a small shop specializing in AMC Jeep vehicles. I can imagine that at the time, $180 was an extraordinary amount to spend on a camera. I can't thank him for making the sacrifice to buy the camera so that I could some 40 years later flip through an old album of photos and look back at my childhood.